Can You Grow Mushroom From Dried Caps? Do Mushrooms Need Light to Grow? Is It Okay to Grow Oyster Mushrooms in Hickory or Maple Wood? Why Do Mushrooms Only Grow in the Fall? Whether your lawn and garden has been overtaken by edible or poisonous wild mushrooms, these rapidly growing fungi can cause damage to other plants and vegetables. Wild mushrooms may drain necessary nutrients from surrounding soil, causing desired plants to receive less than they need to thrive. Fortunately, fungicide solution is readily available at home and garden centers nationwide, and the application process is simple and straightforward. 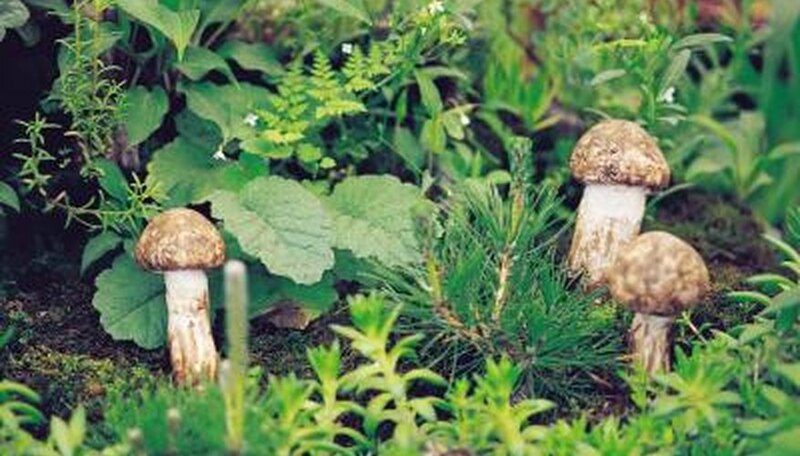 Eliminating wild mushrooms from your lawn is a basic process that does not require specialized gardening skills. Hand pull patches of wild mushrooms. Dispose into plastic trash bag and seal tightly. Fill an empty, clean spray bottle with two cups room temperature water. Add 1/4 cup of fungicide. Ensure that the spray nozzle is closed and shake well. From a distance of 6 to 8 inches, spray the fungicide solution where mushrooms have been growing. Leave to dry and don't rinse off, as the solution will work to effectively kill wild mushrooms over a period of 3 to 14 days. Spot check the area over the next two weeks to ensure no new mushroom growth. If mushroom growth is observed, repeat the process of spraying fungicide. Pick or rake up the mushrooms that you find in your lawn. The spores are less likely to spread to other areas of your grass when this above-ground fruiting body is removed. Reduce your lawn's watering schedule. Mushrooms thrive in moist conditions and a drier environment does not encourage fungal growth. Use an aerator to improve the oxygen flow and drainage of your lawn's soil. Reducing any standing water discourages the toadstools. Apply a nitrogen fertilizer at a measurement of 1 pound of nitrogen per 1,000 square feet of grass. The fertilizer quickens the decomposition process before the mushrooms have a chance to develop. Remove any old wood and/or grind down the stumps in your yard. Mushrooms decompose these materials; therefore, getting rid of this food source reduces the chances of their appearance. Pile up a nutritious growing foundation of wood shavings, compost or soil. Purchase a mushroom culture from a garden or hydroponic shop. Mushrooms grow from spores rather than seeds, and are only available as plugs or injectible cultures. Follow the directions on the package to inject the culture into your foundation, and leave the culture to take root. Water the mound every day with a watering can to maintain moisture for the mushrooms, but don't over water; mushrooms won't grow in muddy or swampy foundations. Expect mushroom sprouting in six to seven weeks. Trim overhanging trees, shrubs and flower foliage to increase the sunlight in your flowerbeds. Mushrooms prefer shaded growing environments. Reduce watering your flowers as much as possible. Mushroom spores need moist soil to grow, and drying out the soil can dehydrate existing mushrooms and prevent the growth of new mushrooms. Remove all organic waste from your flowerbed. This includes fallen foliage and rotting mulch. Such waste material provides food for mushrooms. Put on gloves and remove any mushrooms as soon as they emerge. Mushrooms spread by spores, and collecting the mushrooms helps prevent the spores from continuing to spread. Over time, the mushrooms' presence should decrease dramatically. Apply a fungicide formulated with iron sulfate and intended for mushroom and lichen growth. Administer according to the label's guidelines, as toxicity varies by product. Fungicides will have little effect on mushrooms that are already growing, but will help kill any surface spores. Remove the top 3 to 4 inches of topsoil in your flower bed, using a spade. This helps get rid of any dormant mushroom spores lying in the soil. Reserve this step when all other methods of mushroom minimization and removal fail. Inoculate your hardwood sawdust medium with Enoki mushroom spawn, supplied in a syringe. Your medium must have been sterilized to kill pathogens and stored in a clean glass or plastic container. You may skip this step if you have pre-inoculated spawning medium. Allow your Enoki mushrooms to spawn in a warm (about 72 to 77 degrees Fahrenheit) and humid (90 to 100 percent humidity) environment, preferably with increased exposure to CO2. Spawning usually takes 12 to 30 days. Lower the temperature to 50 to 55 degrees, or even slightly lower, to induce pinning (growth). If you don't have a cool enough place for them, you can even put them in the refrigerator. 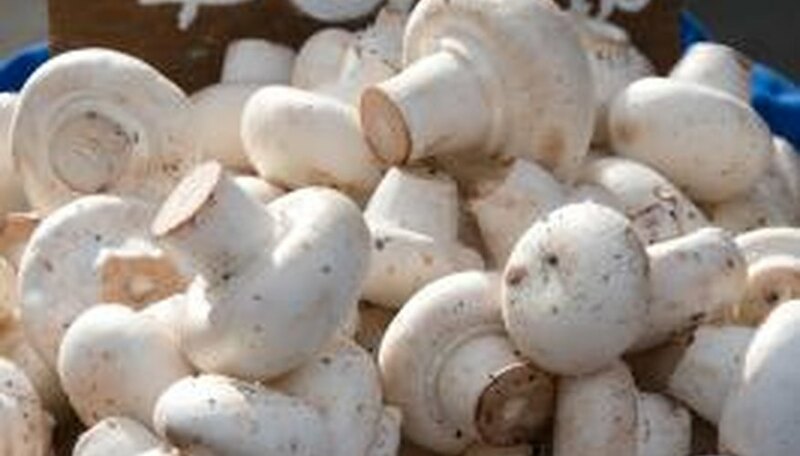 You can also now reduce the amount of CO2 the mushrooms are exposed to by 80 to 90 percent. They will not need any exposure to light. Harvest your Enoki mushrooms. You may be able to get another crop in two to three weeks. After that the growing medium is spent. Enjoy your Enoki mushrooms in soups, salads and stir fries. 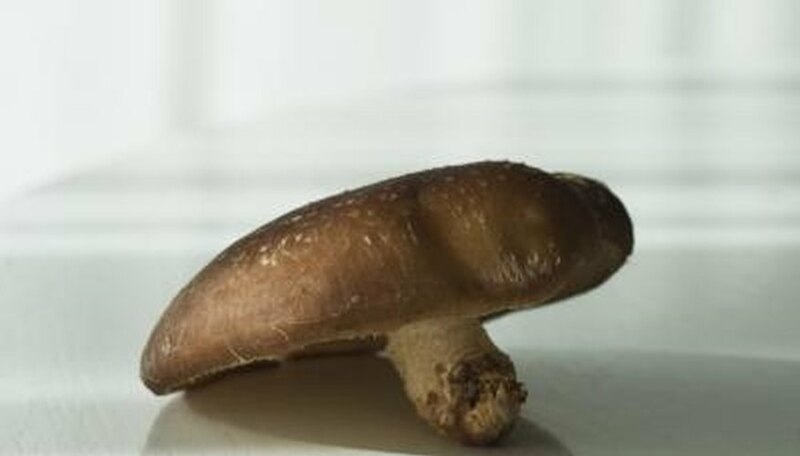 Be aware that they won't last long after harvest time.They can be dried in a dehydrator, but mushrooms don't freeze well. Button mushrooms, the type that are found in grocery stores, are best grown in a cave environment where temperatures are maintained at a constant 65 degrees Fahrenheit. Oyster mushrooms tolerate a wide range of temperatures between 59 and 86 degrees Fahrenheit and are one of the easier varieties to grow. Enoki mushrooms that look like small white buttons on top of a long slender stem grow in temps ranging between 35 and 55 degrees Fahrenheit. They can be grown in the refrigerator. Beech mushrooms grow best in a narrow temperature range of 60 to 64 degrees Fahrenheit. Their mycelium will not develop unless this narrow temperature range is achieved. Shiitake mushrooms that grow outside on logs endure a wide temperature range. They will be triggered to fruit during the spring or fall after a soaking rain and a temperature drop of 10 degrees Fahrenheit. Shiitake logs can be forced into fruiting by soaking in 60- to 65-degree Fahrenheit water for 24 to 48 hours. Prepare the grow box by mixing two parts potting soil to one part fertilizer. Fill the box halfway with the soil mixture. Scatter the morel mushroom spores over the top of the soil in the grow box. Cover the spores with a 1 inch layer of soil and fertilizer mix to shield them from the light. Liberally water the grow box until the soil is black and wet. Cover the grow box with a thick sheet of black plastic, and anchor it down with cinder blocks or other heavy objects to keep it in place. Keep the soil moist by watering it until it is black and wet once a week. Keep the grow box covered with the black plastic, only airing it out when the sun goes down at night. Eventually, the morel mushroom spores will begin to sprout several morel mushrooms throughout the grow box, which will become ripe and edible once they are dark gray to black in color. Choose a potting location that is moist, warm and dark or shaded. Select a planting tray 1 to 2 inches deep and narrow. Fill the planting tray with substrate. Humus, compost or hay can be used as a substrate for morel mushrooms. Place mycelium in the tray and lightly cover with substrate. Maintain moist, dark conditions until the mycelium begins to fruit. Allow mushrooms to turn brown before harvesting. The caps will turn gray first, but they are not ripe enough for harvesting. Mushrooms reproduce and grow from single-celled spores. Mushrooms generally produce these spores under their caps. Dried mushrooms that contain the spores within their caps can parent large colonies of the fungi. Start a leaf compost pile the autumn before you plan to transplant your mushrooms. Locate your compost pile in the shade, preferably under low-growing trees. Use leaves from hardwood trees such as oaks, elms and maples. Supplement your compost pile with well-rotted manure to introduce extra nitrogen and keep it moist, not wet. Dig straight down around the mushrooms to raise a clump. Lift at least 6 inches of earth to capture the little filaments called hyphae that are the actual fungi that send up the blooms. Put the clump in a large plastic bag, mushrooms included. Keep the contents moist as you carry the colony to its new home. Do not seal the bag because the temperature of the compost will begin to rise, killing the hyphae. Open a space near the edge of your compost pile. Scrape up a bit of earth and turn out the colony onto the earth. Re-cover the colony with compost. You may find mushrooms growing next spring or fall, depending on species. Early spring brings morel mushrooms--and morel mushroom hunters. In Oklahoma, the morel picking season commences in March or April, depending on the previous winter's temperatures and other climate conditions affecting fungi emergence. Familiarize yourself with the hydroponic garden before you start. Learn where the growing pods are, how to fill the water tray, how to close the system and how to turn it on and off. Fill your growing pods with peat moss to act as a support for your mushrooms. Inject the mushroom culture (available at hydroponic and garden shops) into the peat moss. Use one mushroom culture for the entire crop by only injecting a small amount into each pot. Mushrooms will grow from the spores inside the culture. Mix mushroom-specific nutrient solution with pure water, per the instructions on the label. This solution will provide the minerals and vitamins that mushrooms would normally derive from soil, in nature. Pour the nutritious water into the water tray and turn the hydroponic garden on, to start circulating water through the peat moss for the mushrooms. Put the hydroponic garden in a protected place, where it will receive only filtered, indirect sunlight. Refill the water tray if it runs dry and keep the system closed if you can. Look for mushroom sprouting in six to eight weeks. 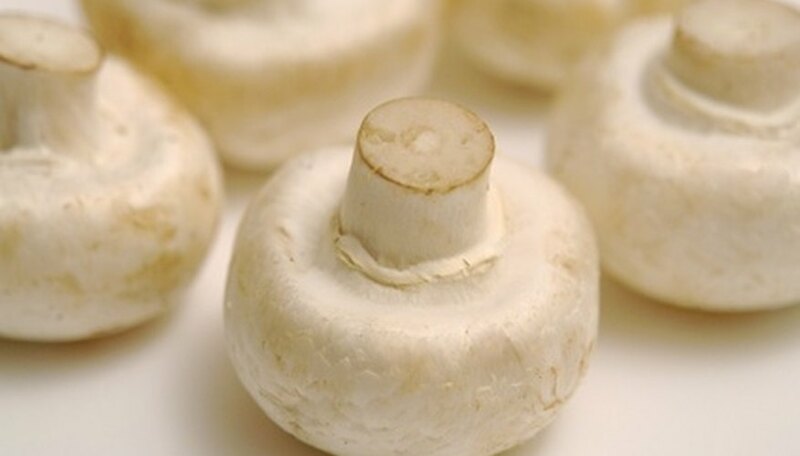 White button mushrooms are usually grown in darkness, but other types of mushrooms require some indirect light, including mushrooms grown on logs or from kits. Never expose growing mushrooms to direct sunlight. Oyster mushrooms grow well on maple wood. Alternate woods for growing oyster mushrooms include aspen, cottonwood, beech, willow, sweetgum, or tulip poplar. Hickory wood better suits shiitake mushrooms, although even shiitake mushrooms prefer oak or chestnut over maple. Remove the mushroom cap and stem from the ground with your hands. Dig under the area of the mushroom with the trowel at least six inches down into the soil. Dig up and discard this dirt, roots or mulch. This is important because the fungus can still spread if it touched these areas. Replace the missing soil with new potting soil. Remove any thatch if necessary, because this can encourage wild mushroom growth. Getting rid of it with the rake will allow more sunlight and circulation to get in the dirt, which discourages mushroom growth. Remove rotting wood, compost, grass clippings and other similar materials from the area where you are having problems controlling wild mushroom growth. These can all contribute to mushroom problems. Consider switching up your yard's watering plan, especially if you live in a wet environment. If you decrease the amount of water your yard gets, it will help decrease mushroom growth. Dig up the mushrooms from your garden using a spade or shovel. Remove all of the mushrooms and discard them or toss them in your compost heap if it’s far away from your garden. Spray the mushrooms with a fungicide. Follow the directions on the label exactly. The fungicide will usually kill the mushrooms but won’t necessarily prevent spores from producing new mushrooms, so you may need to use several applications of the fungicide. Lay landscaping fabric or black plastic around your garden plants. Cut the plastic or landscaping fabric so that you don’t cover any small shoots of garden plants or seeds. Brush away debris from the morels using a soft pasty brush. 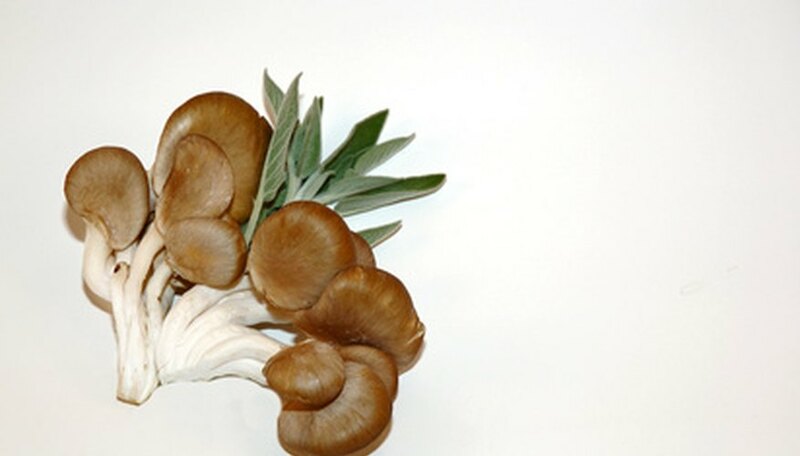 Rinse the mushrooms quickly in cold running water and allow them to drain on paper towels. Slice or cut morels into uniform sizes that fit your dehydrator tray. Place the mushrooms in even layers on your dehydrator trays. The mushrooms can touch, but do not allow them to overlap. Place the cover on the dehydrator and turn the machine on. Allow the mushrooms to dry for 8 to 10 hours. Test the mushrooms for dryness after the recommended drying time. The morels should be dried to the brittle stage, meaning the mushrooms will crack when pressed with the fingers. Store dried morels in airtight containers until needed. Remove hardwood mulch, rake the soil beneath it and allow the soil to dry. Apply pine needle or pine bark mulch instead of hardwood. Remove dead or decaying woody plants and trees that you suspect may have root rot. Dig up wood debris. In new construction, especially, wood becomes buried under the soil. If conditions are moist enough, the wood begins to decay – ideal for the stinky squid mushroom. Wild mushrooms grow in the late summer through the fall season once temperatures cool and moisture levels increase, as these conditions are optimal for fungus growth. Mushrooms grow from spores that are produced in the warm, dry summer months. Morel mushrooms are one of the delicacies of the fungi world and have a limited lifespan to picking them. The best time to pick morel mushrooms is in the early morning, preferably when moisture is still on the ground. Clean the mushrooms by brushing away the dirt with a mushroom brush. Rinse them lightly with water, if desired, but don't soak them or they'll become mushy. Cut the mushroom in half along the stem. Check for bugs. Dip the mushroom halves in beaten egg, then in a mixture of flour, cracker crumbs and seasoning. Fry in butter, two to three minutes each side. Drain on a paper towel and serve. Find the area in your lawn where the mushrooms are growing. Remove the mushroom's fruit body and its root. The fruit body contains many spores, which will spread throughout the area and grow if not completely removed. Keep the affected area of your lawn dry. Mushrooms grow in moist, damp areas, so if you reduce the amount of water to the area, the mushrooms will not receive the proper water supply they need to grow. Place soil or gravel in the area where the mushrooms were growing. This will help keep the area dry as well as prevent spores from spreading. Place the mushroom planting material in a glass container such as an aquarium tank. The type of growing material will depend on the kind of mushrooms being grown. Some grow best with wood while other are better with manure or straw. Set the container in a dark area that is damp and cool. A basement is a great place for this. The temperature should be around 70 degrees until the mushrooms start to grow, then it should be lowered to about 60 degrees. If they are growing in a cool area, the best way to do this is to set up a heater for the initial growing time, and then turn it off later. Sprinkle the spores on the growing material. There is no need to cover it up. They will grow right where they land. Make sure the the spores you use are bought from a reliable dealer to insure good mushrooms. Pick a spot to grow mushrooms that has good ventilation and circulation, and a temperature of 55 to 65 degrees F. Plant in spring or fall for best results and in humidity of about 80 percent. Plant sterilized mushroom farm compost (compost pre-mixed with mushroom spores). Spread this in the planting area. Layer about 1 inch of sterilized peat moss on top. Water to make the peat moss and soil damp. Mist the area two or three times per week with a spray bottle. Continue this care regimen for about four weeks, when the first mature crop should be ready. Cut the stalks at soil level when the caps have separated from the stalk. Sanitize the area and start a new crop when mushrooms stop popping up out of the growing medium. Place compost in a shallow tray. Choose a location for the tray that is moist and humid with warm conditions. Allow the compost to reach 150 degrees F in a dark location. Sustain this temperature for two hours then introduce cool air to produce oxygen in the soil. Lay mycelium in rows just under the surface of the compost. Water generously. Maintain a temperature of 72 degrees F to promote germination of the mycelium. It will spread throughout the compost. This process will last 12 to 20 days. Apply a thin layer of casing over the compost. Mix one part lime with one part peat moss and apply. This does not add nutrients to the compost, but helps retain moisture. Continue to maintain the temperature at 72 degrees for an additional five days. Keep the compost moist. Harvestable portabella mushrooms will be produced in 18 to 21 days after the casing has been applied. The first stage of mushroom growing is the spawn run, during which the mushroom mycelium completely colonizes the selected mushroom growing substrate. Then, fruiting is usually triggered by a cold shock, fresh air and high humidity. Light may be required. A sufficient quantity of pure mushroom spawn must be produced before actual growing commences. Spawn is usually grown on sterilized grain, wooden dowels or in liquid culture. Compost made from horse manure and straw is used to grow button mushrooms and other species that naturally grow in the ground. Compost sometimes must be "cased" with a peat-based layer after the spawn run before mushrooms will form. Wood-inhabiting species can be grown on logs of suitable wood. The logs are inoculated with wooden dowels (plug spawn) colonized with the fungus. Logs can produce mushrooms for up to three years. In place of logs, bags of suitable wood chips/sawdust can be inoculated with grain spawn, plug spawn or liquid spawn. Bags have the advantage of being lighter and easier to handle than logs. Mushrooms grow in a circle because fungus grows outwards from the center. As the oldest mushrooms die, a ring is formed around them. This ring is also known as a fairy ring. Mushrooms must grow in some type of organic substance, such as ground wood chips, hay, compost or leaves. Mushrooms also grow on fallen logs and living trees. 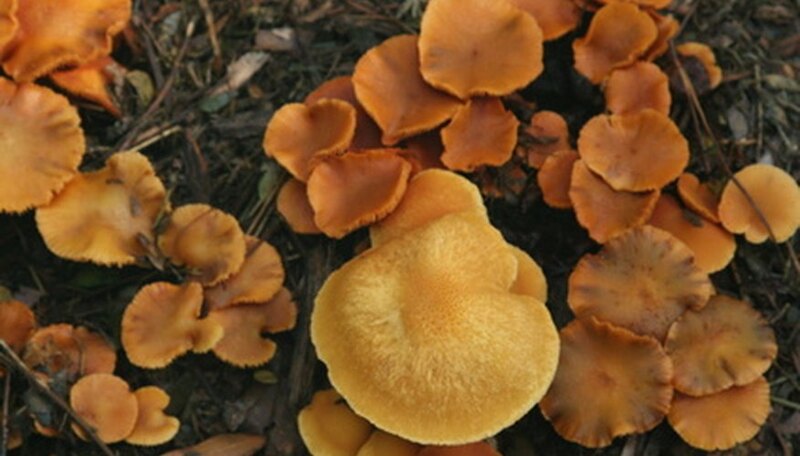 Different varieties of mushrooms prefer certain substrates to others. Mushrooms need mild weather with a stable temperature. Ideal temperatures vary depending on the mushroom species, but those between 55 and 70 degrees Fahrenheit produce the best results. Mushrooms thrive in moist environments. In the wild, mushrooms are often seen sprouting approximately a week to 10 days after a rainy period. 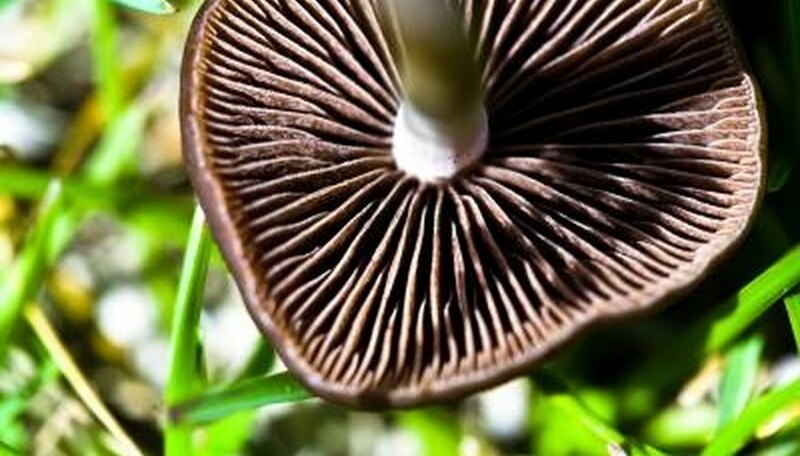 Unlike most plants gardeners show interest in growing, mushrooms develop in dark, heavily shaded areas. Forests provide just such an environment, providing a haven for mushroom growth when other conditions remain favorable. Purchase mushroom kit with the variety of mushroom you have chosen. Start with one variety to become familiar with the process; white buttons are a good first choice. Make sure to order a kit that has prepared substrate included. You can create your own substrate, however, this can take weeks to prepare. Fill a large baking pan with substrate. Spread the flush (mushroom spores) in a thin layer over the substrate. Cover the spores with a thin layer of worm casings, approximately ¼ inch. Place the baking pan in a dark room on top of a heating pad (a top closet shelf with an outlet nearby works well). Set the heating pad to a low setting (you do not want to cook your spores). The worm casings will provide moisture for the spores. Mist with water using a small spray bottle to keep casings moist. Fruiting bodies (mushrooms) will begin to appear in three to four weeks. 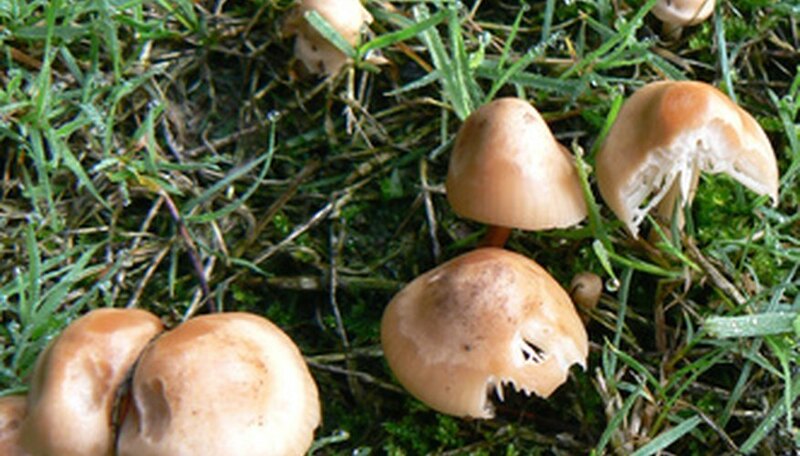 Study your mushroom field guide so that you can recognize potential mushroom finds. You'll want to take your guide with you on your foraging as well to help identify mushrooms you don't know. Go with a group from the Wisconsin Mycological Society if you are new to mushroom picking. Members of this group will help show you where and when to harvest mushrooms and will help you learn to use your field guide to identify types of wild mushrooms in Wisconsin. Plan to visit a number of forest and park sites over the course of the late spring through summer and into the autumn to look for wild mushrooms. Mushroom picking is legal in Wisconsin parkland, although you may not damage or deface any other plants or trees growing in the area. Be well-prepared by taking your guide and a cloth or paper bag for gathering your mushroom haul on your hunting trips. You will also want to take a knife and wear appropriate hiking shoes and clothes. Look for mushrooms near trees, along streams and in other moist places. Use your knife to remove the entire mushroom and stem once you've identified it. Put harvested mushrooms in your bag, knocking off loose dirt beforehand. If you're unsure about the identity of a mushroom, do not pick or eat it. Puffball mushrooms have a round or pear shape and are usually white but sometimes have a grayish hue. The inside of the mushroom is white, yellow or brown depending on the mushroom's age. Shaggy manes have thin bases and tops that are made up of shaggy, brownish scales. Underneath the top of the mushroom are white gills. Coral fungi is made up of several stems that branch off from each other. Coral fungi have a tan color and can be as tall as eight inches. Oyster mushrooms are found growing on trees. These oysters are white and have tops shaped like oysters. White gills run down the oyster mushroom's short stem. Chanterelles are shaped like funnels. Gills are found on the undersides of these mushrooms. Chanterelles have an orange or yellow color.